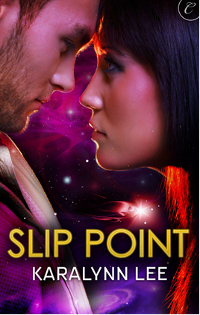 I don’t usually write science fiction, but nonetheless Carina Press recently released Slip Point, my science fiction romance novella. How did I go about it? Because my family moved around a fair bit while I was younger, I’ve always been fascinated by the notion of growing up with the next-door neighbor’s kid. What would it be like to have a friend in your life who knew you from your earliest days? What would it be like to fall for him? Shayalin and Jayce first meet as children, and it means that you know they’re friends foremost, ones who understand the other’s roots. But technology has done funny things to our concept of distance, so to make my young couple into true neighbors, I stuck them on a planet colonized by folks who snub fancy futuristic gear. And of course this gives them an easy goal to bond over: get off the damn planet and reach the stars. It also gave me an easy conflict: what if only one of them made it? It wouldn’t make for much of a story if Shayalin, turned away from the Corps, just went home and raised sheep instead. (Although I did frantically research sheep-herding before I realized this.) She still has a dream, and she’s determined to achieve it through means fair or foul. In a classic space opera move, I gave Shayalin a father of dubious morality. Who can resist a space pirate? Especially if he’s your ticket to getting your own ship? And it’ll just be following in the family footsteps. Put ’em back together again. Sprinkle over with danger. And speaking of resisting space pirates, certainly a high-placed government minister can’t, not when he desperately needs someone with the smuggling skills that Shayalin has ever-so-conveniently gained over the past several years. And he’s got just the guy to keep an eye on her: Jayce. To say much more would ruin the story, but I can promise you (alphabetically, rather than in order of appearance) action, alien first contact, faster-than-light travel, genetic engineering, and of course, romance. To read more, you can buy Slip Point as an EPUB or for Kindle. Karalynn actually only has three recipes that she can successfully cook, which means friends are mysteriously never invited over for dinner for a fourth time. She dwells in the San Francisco Bay Area with two grimly determined plants and a few sneaky silverfish who think they’ve reached paradise in her library. Find more of her writing at karalynnlee.com. Love the classic doom-laden line “I am your father..”. Thanks, Vicky and Coleen! I had a lot of fun writing it. 4ounds like a fun read! – wish you many sales. This does sound like a lot of fun, and I am a sucker for a good sci-fi story. I’ll be adding this one to my cart soon too!